Battledress Brown, Hedges and a Highland Fling. With an impending WWII game, I felt that I should finally finish some British for Normandy and the European theatre. The figures are, I believe, old Hinchcliffe 20mm that I bought of EBay a couple of years ago and promptly stored them. Most of the figures are riflemen in various poses, with one officer and a PIAT. I originally had not intended to paint them as I thought they were already painted to a reasonable standard but I noticed the paint work was worn in a few places and one thing led to another. I completed the repaint back at the start of the year but have only just flocked the bases. I have also recently completed some hedges. I made four lengths of hedge from an old unused luffa sponge. It had been knocking about in a draw for quite a few years while I worked out the best way of turning it into a useful piece of terrain. I cut the sponge into quarters along the axis and then glued the pieces to MDF. I added some gravel to texture the bases and help conceal the bottom of the hedge. I spray painted the lot in dark brown and then over painted it to provide some contrast. Finally I flocked the top of the hedge and the base. The photo below is a sample to show how they turned out. Last weekend my wonderful wife and I went to see the Royal Scots Dragoon Guards in concert and thoroughly enjoyed the experience, my darling wife being particularly enamoured with men in kilts. The theatre was fully packed and the audience very appreciative of the performance, resulting in two encores. There was plenty of singing, sword dancing, piping and drumming, to stir the blood. Indeed it has taken a full week to get one my favourite tunes, “The Black Bear”, out my head. I have been fortunate to recently add two new books to my collection. One I have sought for some time, while the other was a serendipitous find. Both books address my interest in Australian military history, and Tasmanian military history in particular. The first book, “Australian Military Uniforms 1800 – 1982” by Monty Wedd, I was able to purchase for $15.00 on EBay. Although second hand, the book is in reasonable condition (They normally sell for considerably more). The book was published in 1982 and features some 40 colour plates and many black and white illustrations by Monty Wedd. It details the various uniforms worn by the Australian military forces of the individual colonies and then the Commonwealth until the mid-seventies. I am very pleased to be able to add it to my bookshelves as it is a rare gem for anyone interested in Australian military history. The second book I was fortunate to pick up at a local book shop is “Preserving Our Proud Heritage The Customs and Traditions of the Australian Army” by L.I. Terrett and S.C. Taubert. The book was only published in November last year and is a very weighty and comprehensive tome detailing every aspect of the Australian Army through the customs and traditions it has developed and maintained since its formation from the colonial defence forces in 1901. The book also includes a CD of the regimental marches and bugle calls of the Australian Army. I was able to pick up my copy of this brand new book for $15.00 due to it missing its dust jacket and having a very slight bump to the spine. The recommended retail price is about $60.00 so I found a true bargain on a book that is surely a must have for anyone interested in the history and traditions of the Australian Army. Catastrophic failure and a disaster averted. My darling wife and I were sitting quietly in the lounge room at home on Monday when there came a loud creaking sound from one of the other rooms. This was followed by an even louder cracking sound. We went to investigate the cause of the noise and found my painting cabinet listing heavily with some of the curios stored in it already strewn across the floor. With catastrophic structural failure imminent, my wife braced the cabinet while I raced to recover everything out of it. I should explain that the cabinet was huge and featured a slide out desk top and drawer, many cubby holes and shelves for storage, and inbuilt lighting. It stood about four foot high and five foot wide, with a two and half foot depth. It was a massive cabinet that also acted as storage for miniatures and rules. The miniatures were of course saved first and no casualties were suffered. Paints, tools and rules were rescued next, along with various ornaments. With the potential disaster of broken miniatures and paint everywhere averted, the cabinet finally collapsed. A quick examination of the carcass revealed a major internal structural weakness that led to the catastrophic failure. So as I cleaned up the after the titanic disaster I could only think where am I going to put everything? It is just a gentle stroll from the pavilion to the artillery park where over the past few months I have positioned a few vintage field guns that I won on Ebay. All are diecast Britains in perfect working order and still capable of firing projectiles. 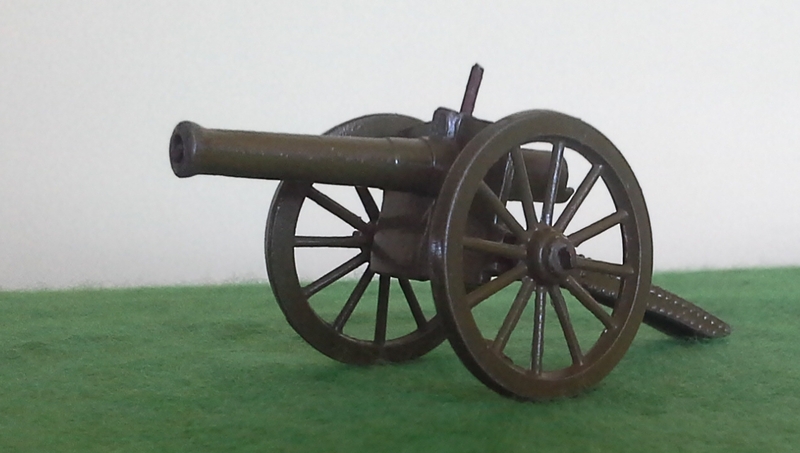 The first is the famous 4.7” naval gun beloved by H. G. Wells, while the other two pieces are “Royal Artillery” guns of different calibres. What will I do with them? Only a time traveller can tell! 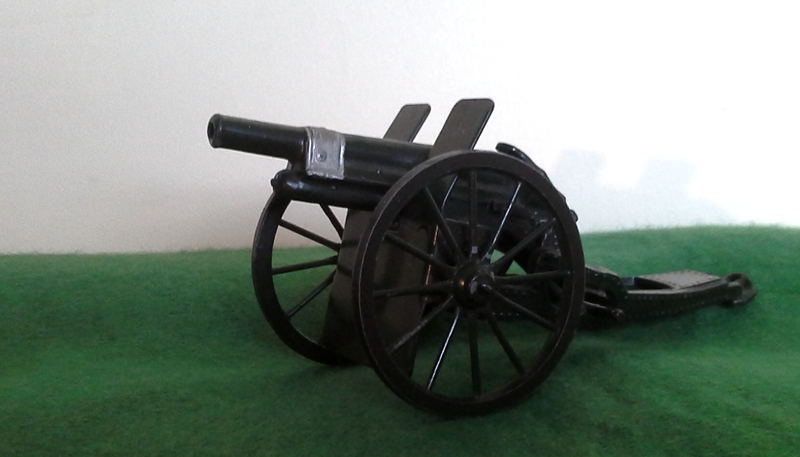 The mighty 4.7″ naval gun mounted on a field carriage. Another new acquisition is “One Hour Wargames: Practical Tabletop Battles for those with Limited Time and Space” by Neil Thomas. The many favourable reviews found on the internet, along with my past experience of Neil’s books persuaded me to purchase it. I have read other books by Neil Thomas and have played and own a copy of his “Ancient and Medieval Wargaming”. There is much to be found of great use in Neil’s books for they are an easy read and his rules are very playable. The first part of the book provides simple rules for some nine historical wargaming periods from Ancient to World War II, along with a potted explanation and historical information for each epoch. Neil boils down armies to four basic unit types and the tactics and mechanics of warfare in each age to its most essential elements. The second part of “One Hour Wargames” largely consists of thirty very useful scenarios with maps for gaming. Each scenario includes explanations and notes about the source of inspiration for them. There are also short sections that deal with campaigns and solo wargaming. Finally the book also has appendices regarding background reading and useful addresses. “One Hour Wargames” is a delightful and thought provoking read for anyone interested in historical wargaming. The provided scenarios are an absolute gem and will be an inspiration for my little wars long into the future. While I have not played the rules they do seem on reading that, despite their simplicity, they are effective in creating a sense of gaming a particular period. 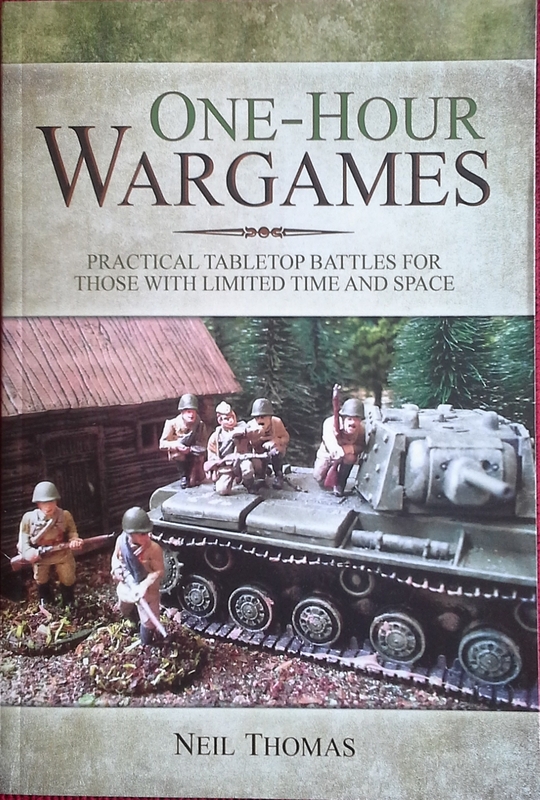 “One Hour Wargames” is a handy book for any wargamer to have on their shelf.